Her heart pounding with fear and exertion, Anna Balog stumbled along the sleet-slick road in Federman, Michigan in the early evening of January 20, 1937. She curled her fingers tightly around the lantern she was holding, squared her shoulders, and pushed her way up the road toward the Irving Karns farmhouse and help. The stranger who had appeared at their farm and told them he needed help getting his car out of a ditch had seemed furtive and desperate to her, but her father Paul Balog and her brother Steve had driven away with him in their farm truck. ​Michigan State Police Captain Lawrence (Laurence) A. Lyon knew the rest and he knew what to do. 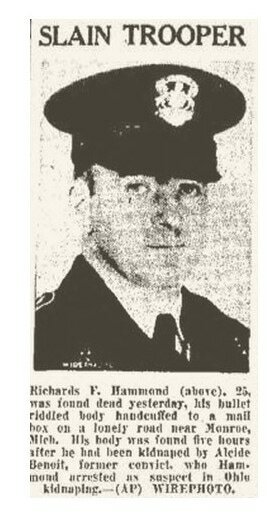 He identified Alcide Frenchy Benoit as the killer of Trooper Richards Hammond. He said Trooper Sineni brought Smith to the Erie Barracks after the gun battle and then joined the search for the former convict. Paul Stear, another farmer, had witnessed the two Balogs being captured and reported their abduction to the police and reported seeing Frenchy force Paul Balog to drive him westward. Warrants charging Frenchy Benoit with murder and with violating the Lindbergh Kidnap Law were issued at Monroe and at Detroit. Frenchy's accomplice, John Smith, was also charged with kidnapping. On March 10, 1950, about three years after his second trial, the prison doctors at Marquette told Alcide Frenchy Benoit, 36, that despite an operation to attempt to stop its progress, he was dying of cancer. They recommended that he be transferred to the penitentiary at Jackson, Michigan, for further treatment. Doctors heavily drugged Frenchy with morphine to manage his pain during the trip and law enforcement officials placed him in the rear seat of a passenger car with two guards, more to monitor his condition than any anticipated dangerous behavior. Two other guards rode with a busload of prisoners who were also being transferred. The caravan stopped for a light meal near Gaylord, Michigan. The guards left Frenchy handcuffed in the back seat and by all appearances unconscious from the sedation the doctors had given him, and stepped outside to refuel the car. His Civil War veteran grandfather, Alpheus and his grandmother Esther are buried with him in Hanover Cemetery and so are his father Frank and his mother Dora. Trooper Hammond is listed on the Fallen Troopers Memorial in Lansing, Michigan. Long Beach Independent, Long Beach, California. March 11, 1950, p.